There are 2 reviews for 'Fernz Gate'. I’m better finding points to improve, than points to praise. So assuming that anything I’m not criticizing is probably worth praise is acceptable. This was too long ago. The game seemed fine, although I was a little weary with the story. The battle mechanics are pretty much the same from Asdivine Hearts II, except for the Rubrix (or whatever it was called) – Fernz Gate is back to the 2+1 rings. If you absolutely hated the team system, you may not stand this game (although Auto is very effective most of times). There is a new monster type, too. If I were to complain I would say something about I defeating the True End Boss in two hits… And how useless were the physical skills? Well, although I rarely (almost never) used physical skills, and because my OP magic I didn’t used BGS either. The game is great no matter how I try to look at it. I’ll write “They actually put effort into this game” as a Pro point, because you can’t compare this title with, say, Asdivine Hearts 2. The game is much better in every aspect. Gameplay is decent (Although I crit! so often with magic skills, I totally forgot what metal monsters are), Controls are intuitive and there is no hindrance (eg. 200 taps to save, or things at “odd” places), Story is neatly done (and I laughed a little at points – well written! ), there were some minor, meaningless typos you most probably won’t find while playing (unless you are actively seeking for them). Magic skills can get overpowered quite easily, specially the unisons. After thinking deeply and comparing with Asdivine Cross, I really must give only 4 stars for skills. Only thing I hate about it is that only the sub may use items. I did bought the premium version for the standard price, and have absolutely no regrets. Unless any of the points I wrote really despise you, this game is worth its price. 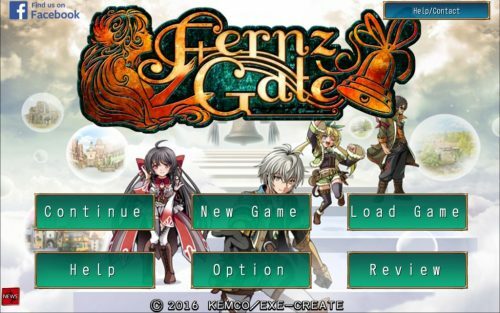 Fernz Gate is definitely one of Kemco’s better games. Anyone who’s played the Asdivine series will feel right at home with the controls and battle system, and yet the story is unique and original (and for once, NOT at all cheesy… don’t get me wrong, I like the cheese in Asdivine, but it’s refreshing to see an absence of cheese in this game). The main characters come to Fernz Gate from “other worlds,” and must defeat the Overlord in order to return back home. The story, and the dialogue, are top notch, and while you can usually “Auto” battle the random encounters, the bosses in late stages do present a good challenge. The game has a Normal End and a True End (True End adds about 1.5 hours), and another 6-8 hours of really cool bonus material grinding in various dungeons. All 4 party members are actually "likable"